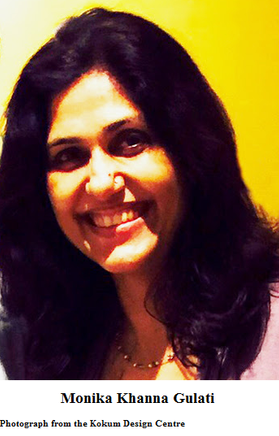 Monika Gulati is a communication designer, educator and founder member of SkyBLUE Design, who in the last few years has been actively involved in solving waste management issues and spreading awareness wherever she can. It all began with a small composter that her youngest son won in a competition five years ago. At first there was uncertainty as to what should be done with it but after a few months Monika says, ‘We started using it and miraculously all our kitchen waste and other green waste was turning into this beautiful compost.’ This led to segregation of waste and soon the amount of waste going out of the house was reduced to a maximum of 200 grams of waste in 3 or 4 days. ‘There is very little waste that goes out of our home that cannot be processed, recycled or reused,’ says Monika. To most of us, the ultimate fate of the waste that leaves our homes matters little. We are content with the idea that the waste has left our homes. The repercussions of our actions and ignorance are making themselves felt in the form of disease, foul smell, polluted air (from the burning of waste), respiratory problems, contaminated water, clogged drains, etc; and even monumental problems such as the flooding in Mumbai in 2005 and more recently in Chennai. This has prompted some citizens into taking some initiative in driving waste management programmes in a way that will decrease the burden on ever increasing landfills. The start to the solution is segregation according to the revised rules (2016) of the Environment Ministry of India, which is a three way segregation: organic waste, recyclable waste and reject/sanitary waste. The people of Bangalore actually went ahead and filed a public interest litigation to ensure that segregation takes place in this manner at source in homes and they won the case in 2015. The initiative is called 2Bin1Bag, with organic/biodegradable waste going into a green bin, reject/sanitary waste into a red bin and recyclable waste into a bag. The reject/sanitary waste will either end up in landfills or be incinerated. Monika mentions the clay incinerators developed by Swati Bedekar (Vatsalya Foundation) and her husband to convert sanitary pads to ash that can be used as manure (nonetheless the effects of the emissions are not known and are more likely to be harmful because of the chemical components in sanitary pads). Electronic waste makes up a large quantity of hazardous waste that categorically must not be mixed with other garbage. Electronic waste is best kept in a separate bin by the community, away from other rubbish, to be taken to the e-waste recycler in the city; it can even be exchanged for a remuneration. The toxicity of electronic waste should not be underestimated in its ability to inflict long term damage. The leachate from landfills holding electronic waste destroys the soil and can contaminate the groundwater causing unspeakable harm to human beings. The black plastic garbage bags are in themselves a problem besides the other numerous plastic bags used to carry shopping items. The best solution for the black garbage bag is using the 2Bin 1Bag method, and reusable cloth bags instead of plastic shopping bags. We should furthermore reduce our usage of plastic and derived products such as Styrofoam which are not biodegradable. Monika is practical in her thinking when she says it is not always easy to rally an entire community together to work towards the goal of waste management because of the lack of a collective conscience. In this case, the best way forward is to gather a few people who are enthused at the idea which in turn would set an example for other people. There is a number of innovations that have appeared on the market as a result of some people waking up to the growing garbage problem. Poonam Bir Kasturi, an NID (National Institute of Design) alumnus, has designed terracotta pots (eg the kambha/stack composter) that act as composters for your biodegradable material. These are quite easily available and are made in an environmentally friendly manner. Plastic drums with holes drilled into them for air supply can be used as composters. There are some permanent compost bins made of mortar and bricks which require you to manually mix the waste material around more than others to allow air to circulate. If this is not done then the material begins to attract vermin and gives a bad odour. Water should be added periodically to maintain moisture level. The mixture should not be too wet or too dry. Accelerators need to be added to aerobic (where air is required) composting and buttermilk (sour curd mixed with water) is one most easily at hand in Indian homes. Panchagavya, made of cow urine, milk and dung, and ghee and curd makes an excellent accelerator, as does bioculum, which is a mixture of microorganism cultures. Bioculum rids the waste of pathogens, foul smell and weed seeds. Accelerator and green waste plus dry leaves, coco peat or sawdust, which provide the carbon content, combine together give you your compost. Sawdust has to be used carefully, making sure it is not infested with termites since this can affect your compost and the area where you use it. ‘In four to six weeks you have this beautiful, earthy smelling compost,’ says Monika. Crushers are machines that are important because they allow the food waste to be processed faster. 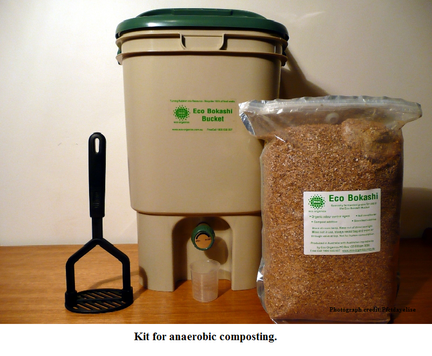 For people with hectic schedules, there are anaerobic/ bokashi ('bokashi' is Japanese for 'fermented organic matter') composters. These do not need oxygen but bokashi bran with beneficial microbes should be added to the kitchen waste after smashing the waste down to remove the presence of air. This helps the process of fermentation. The bin has to have the lid tightly fitted to prevent oxygen from getting in. The bin has a spigot which allows you to drain the bin every two to three days. 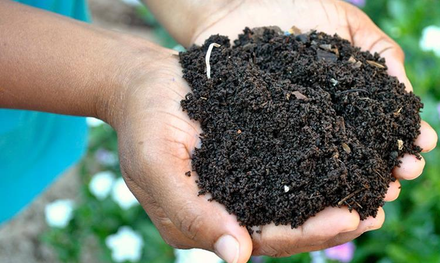 The leachate obtained when diluted with water is also good for your garden soil. The fermentation of the waste is only the first stage and it needs to be mixed with soil or compost to complete the process of composting. The companies Eco Bin and GreenTech Life (Smart Bin) of Bangalore manufacture these composters and they are available online. For those communities with large amounts of garden waste, a composting bin made up of a bamboo frame of four feet by six feet, covered with dry palms, can be used. The garden waste should be shredded and added to it. Shredding reduces the volume and enables the composting process to take place faster. This waste could be mixed with cow dung slurry (two handfuls of cow dung added to a bucket of water) to act as an accelerator. This is called platform composting. There are biodigesters, which can produce fertiliser and biogas from biodegradable waste, and bio-bins to be used at a community and individual household levels. Compost tumblers are more appropriate for bigger communities of even up to 1400 homes. These are motorised and can be turned on for about 20 minutes a day to do at least one rotation for aeration. Adding microbes to the waste in tumblers will produce compost in 12 days. There is a new type of compost tumbler that has a shredder integrated, so your waste is shredded before it starts turning to compost. Crate composting is for communities and houses with not much space around. It can be put up on a terrace or in a garage. Once the waste is layered with ready compost and dry grass or leaves the smell should not be too much of a problem. Other types of composters include barrel biodigesters, steel bins, and wire mesh composters, etc. You can visit the websites given below for more information about recycling, segregation, composting, etc.